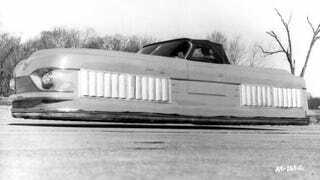 What Cars Would Be Best As Hovercars? Yesterday, our resident badass Robb Holland showed you Lexus’s incredible Hoverboard. That got us thinking, what if this technology made its way to our automobiles? Imagine the possibilities! What car do you think would make the best hovermobile? Automakers have promised us hovercars for years, but they’ve always been blowing smoke. Yesterday, though, we showed you that Lexus might be onto something. They’ve figured out a way to make a skateboard float, so it’s only a matter of time before we’re all driving cars that glide down the road like magic carpets. Imagine a world free from rolling resistance. No more need for suspensions. Just nice, Cadillac-smooth driving all the time. But some cars would make terrible hovercars. A Jeep Wrangler, for example, won’t exactly be able to hover over giant boulders in Moab. Other cars, though would make great hovermobiles. What do you think? Which cars would you like to see hovering down the road in the future?